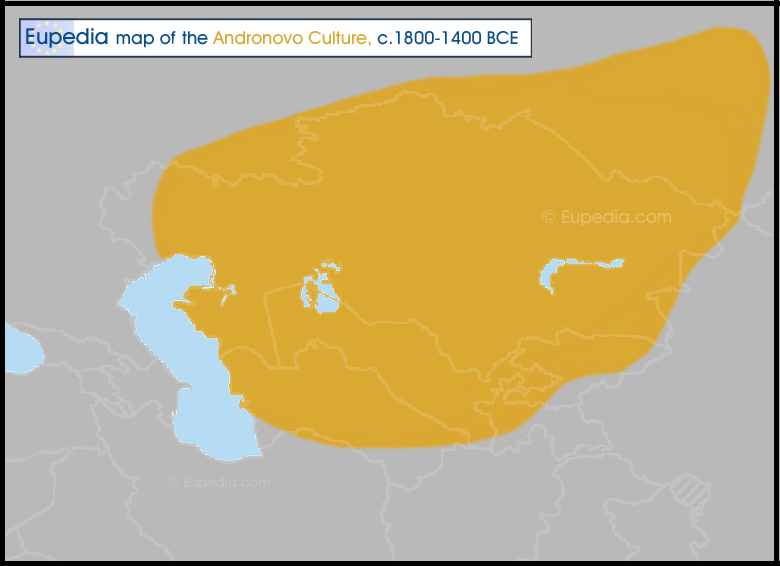 Descended from the Sintashta-Petrovka Culture and suceeded by the Karasuk Culture (1400-800 BCE). Considered to be the ancestral culture of the Proto-Indo-Iranian speakers, and therefore of the Indo-Aryan, Iranian, Dardic and Nuristani people. Semi-nomadic pastoral economy based principally on cattle, sheep/goat and horse herding. Some settled farmers around the Amu Darya. Regular use of horses for riding and for drawing chariots. Flat-bottomed, well smoothed pottery decorated with geometric patterns. Intensive copper and bronze mettalurgy with distinctive curved bronze knives and twisted earrings. Pit-houses were partly dug into the ground (semi-subterranean), with deep storage pits and corridor-shaped exits. Dwellings were spacious (80 to 300 m²) and constructed on two rows either in a semi-circular or rectangular plan. They were usually aligned overlooking river banks. Inhumations in underground timber or stone chambers inside round or rectangular kurgans. The bodies were accompanied by sacrificed animals (mostly horses and dogs), chariots, cheek pieces, weapons, pottery and jewellery. The following mtDNA samples from the Krasnoyarsk area in southern Siberia were tested Keyser et al. (2009). The following samples were tested by Allentoft et al. (2015). RISE500 - U4d1 Kytmanovo, Altai Krai ? Keyser et al. (2009) also tested two samples from the Karasuk culture in Khakassia (south-central Siberia) in southern Siberia. RISE495 R1a1a1 D4j1 Arban 1, Altai Krai ? RISE497 - A Arban 1, Altai Krai ? RISE499 - H5a1 Bytrovka, Altai Krai ? Lalueza-Fox et al. (2004) tested 8 samples from the Karasuk culture in Kazakhstan.